I am thrilled to announce that I will be singing at The Sainsbury's Sport Relief Games this Sunday at around 1.25pm in front of an estimated crowd of 75, 000 people! I can't wait to be a part of an concert that truly promises to be 'A Night to Remember'! As the UK Ambassador for Half the Sky, I am delighted to tell you all that the incredible story of Jenny Bowen, founder of Half the Sky, is soon to be available! John Harvey kindly invited me to sing at his Church for this stop of my Christmas Tour, so I’ll let him tell you all about it! Chris and Abby Eaton very kindly invited me along to be their special guest for their Christmas Tour Finale at Himley Road. The first time I performed at this wonderful Church was with Chris and Abby Eaton a couple of years ago so I was delighted when this date was added to my tour! Not only is it a great, theatre style building, but the people who make up the Church are some of the most friendly and welcoming you could ever meet! They treated us very well and made the concert run very smoothly and made the whole evening feel very relaxed. With the Harrodian School Choirs and Special Guest Isabel Suckling, Sunday 8th December. A big thank you to my good friend Charles Haswell for all his help in organise this concert at St. Mary’s Church in Barnes! He had the wonderful idea of inviting the Harrodian School Choirs along to join me and I was delighted when they agreed! Saturday 7th December: Concert in aid of The Door Youth Project. The Door Youth Project is based in Stroud and is charity that helps young people and their families. I’ve known the door for eight years now and was honoured when they asked me to become one of their patrons! 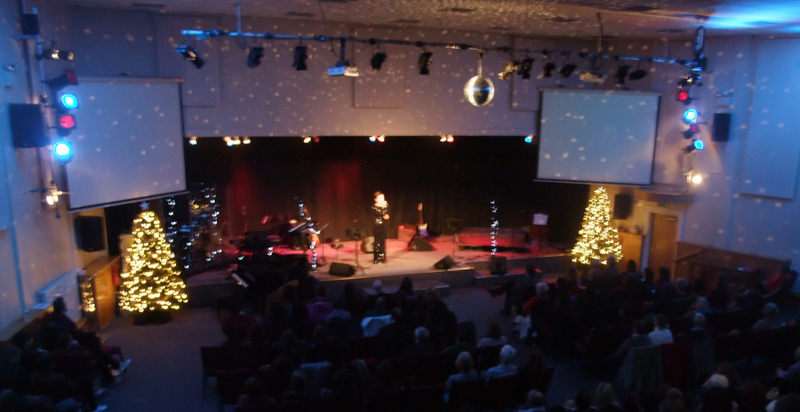 So my Christmas Concerts are now well and truly under way! It all began on the 5th of December in The Daffodil in Cheltenham. The Daffodil is a wonderful restaurant with fantastic food! I sang a total of four sets while dinners enjoyed a welcome drink and a three course meal — which looked delicious! Unfortunately I can’t eat before I sing, so I’ll be looking forward to going back to The Daffodil for a meal in the future! I’ll be singing at Chessington Methodist Church this December. For more details visit the Show section of the website.